As a moving image art form, experimental animation blurs the boundaries between art and craft, intangibility and materiality, conceptualism and sensuousness in wide-ranging and thought-provoking ways. This chapter considers experimental animation alongside the concerns of craft as a physical, artistic and critical practice. It focuses in particular on issues of (im)materiality, the act of making and the significance of skill—the last of these especially as it relates to what craft theorists call “sloppy craft” (Wilson 2015, xxiv), or the purposeful application of imperfect technique as a subversive practice and form of social critique. Drawing from art history and craft theory, the chapter reveals some of the complex ways that craft undergirds and shapes our understanding of experimental animation as an art form. Failes, Ian. 2017. “The Beautiful Side of ‘Ugly’: How a Film Embraced Errors and Happy Accidents in CG.” Cartoon Brew. May 12. Accessed May 25, 2018. https://www.cartoonbrew.com/shorts/beautiful-side-ugly-film-embraced-errors-happy-accidents-cg-149823.html. Moritz, William. 1997. “Digital Harmony: The Life of John Whitney, Computer Animation Pioneer.” Animation World Magazine, Issue 2.5 (August). Accessed May 25, 2018. https://www.awn.com/mag/issue2.5/2.5pages/2.5moritzwhitney.html. O’Reilly, David. 2009. “Basic Animation Aesthetics.” Davidoreilly.com. Accessed June 1, 2018. http://www.davidoreilly.com/downloads/. Sarrat, Sara Álvarez, and María Lorenzo Hernández. 2013. 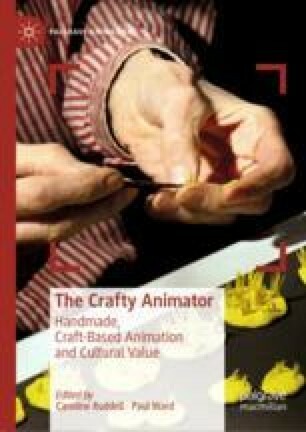 “How Computers Re-Animated Hand-Made Processes and Aesthetics for Artistic Animation.” Animation Studies Online Journal 7. January 23. Accessed May 25, 2018. https://journal.animationstudies.org/sara-alvarez-sarrat-and-maria-lorenzo-hernandez-how-computers-re-animated-hand-made-processes-and-aesthetics-for-artistic-animation-2/. Snoad, Laura. 2018. “Nikita Diakur’s Chaotic Animations Are a Gross Study in Dynamic Computer Simulation.” It’s Nice That. May 1. Accessed 1 June 2018. https://www.itsnicethat.com/articles/nikita-diakurs-ugly-animation-010518. Stark, Mary. 2013. “From Fibre to Frock, 16 mm Film Loop Using Cotton Spools.” Vimeo. https://vimeo.com/57236528. Stark, Mary. 2014. “Points of Translation and Transformation.” Blog. Artist Residency at La Escocesa, Barcelona. https://marystarkbarcelona.wordpress.com/2014/01/31/points-of-translation-and-transformation/.